Browsing the archives for the germany tag. The populist right-wing Alliance for Germany (AfD) had a chance to repeat the success it enjoyed in state elections in Saxony two weeks ago in two state elections last Sunday, which both also took place in the former East-Germany. 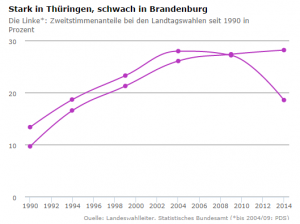 But in both Brandenburg and Thüringen, it went one better and got double-digit percentages. 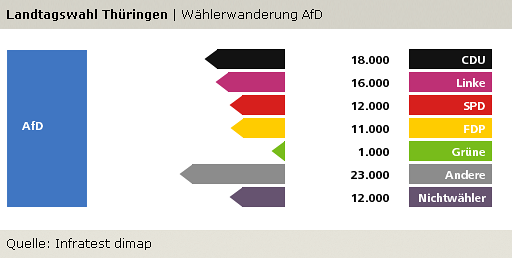 The AfD got 12% of the vote in Brandenburg (sometimes nicknamed “the small GDR”) and 10% in Thüringen. Just like in Saxony, the AfD took votes from across the political spectrum, pollster Infratest Dimap revealed. In Thüringen, just like in Saxony, the Christian-Democratic CDU, Social-Democratic SPD and (ex-communist) Left Party all saw 5-6% of their 2009 voters switch to the AfD, while the liberal FDP and extreme-right NPD lost significantly larger shares of their electorates to the party. On the bright side, the SPD in Brandenburg easily maintained their position as the state’s top party, though the Left Party, which had been their junior government coalition partner, lost a lot and booked its worst state elections result there since 1990. Nevertheless, just like last time, Brandenburg’s SPD is free to choose to govern with them or with the CDU; either combination would have a majority. In Thüringen, weirdly, the SPD has the same luxury of being able to pick its coalition partner, even though they lost heavily and were left with just 12% of the vote. Both the CDU and the Left Party did well, cementing their positions at the top of the state’s party system, and they both want to govern – but neither of them can do it without the Social-Democrats. So it will either be a renewed CDU/SPD government, with a parliamentary majority of 1, or a Left Party/SPD/Green government, also with a parliamentary majority of 1. The latter would of course be more ground-breaking and exciting, but oddly enough the three parties actually pooled less of the state vote (46.3%) than five years ago (52.1%), and obviously back then the Social-Democrats chickened out, even though they were promised the Prime Ministerial post by the (larger) Left Party. However, their chickening out last time round, and their stubborn refusal to express a preference for one or the other coalition option in this year’s campaign, led to them losing a fair amount of votes to the Left Party in these elections. So maybe they won’t do it again. 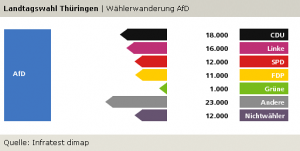 The Left Party in Brandenburg lost 19 thousand voters to the AfD, which attracted some attention; in part because of the curiosity of a stridently left-wing party losing voters to a populist right-wing party, and that not being an isolated phenomenon either, with far-left losing votes to far-right parties elsewhere as well; and in part because the AfD seemed to go out of its way to fish for Left Party votes. But to keep this in perspective: the Left Party also lost a whopping 119 thousand voters – six times as many – to the non-voter camp. Vice versa, the CDU in Brandenburg had a good night, overtaking the Left as the state’s second-largest party for the first time since 1999, but nevertheless also lost 19 thousand votes to the AfD, meaning that the CDU lost a larger share of its 2009 voters to the AfD than the Left Party did. What these numbers mean is that the CDU lost 7% of its 2009 vote in Brandenburg, and 5% of its 2009 vote in Thüringen to the AfD; the Left Party lost 5% and 6%, respectively, of its 2009 vote in the two states to the AfD; and the FDP lost 14% and 12% of its vote, respectively, to the AfD. 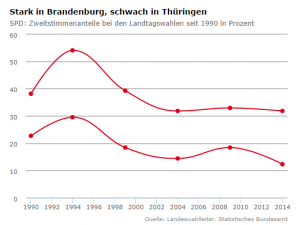 The SPD lost 6% of its 2009 vote in Thüringen to the AfD, but just 3% of its vote in Brandenburg. More data on who voted for whom: In both Thüringen and Brandenburg, the AfD’s best professional groups were workers and the self-employed. And in both states, the Left Party did best among the unemployed and pensioners. 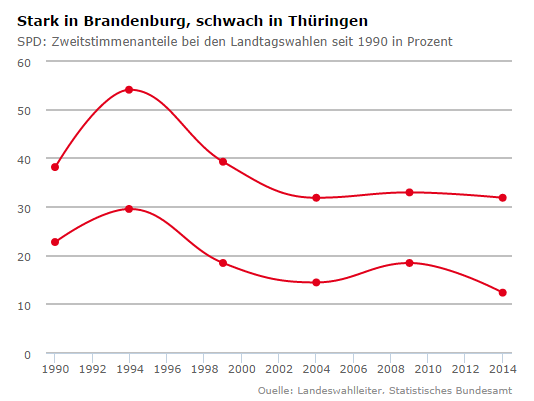 Here’s a worrying data point: for both the SPD and the Left Party, in both Brandenburg and Thüringen, the best age group was those over 60+. The fact that it’s true for both parties makes it all the more worrying about their long-term future in these East-German states. Meanwhile, the best age group for the AfD in both states was those between 25 and 34. Last Sunday’s state elections in Saxony were marked by a low turnout, an only slightly eroded dominant position of the Christian-Democrats, and an imposing result for the right-wing, anti-system Alliance for Germany (AfD) party. The AfD was helped by the fact that these elections, the first state elections it ever took part in, took place in the very state where the party had already done best in the federal and European elections. Nevertheless, its 9.7% of the vote was remarkable and well beyond what the polls had foreseen. Election night had its share of suspense as the extreme-right NPD hovered right around the 5% electoral threshold. It ended up missing it by a hair and getting 4.95%, which means it’ll be cast out of state parliament after ten years in its stronghold state. There are several interesting geographic dimensions to the results, and I created an infographic at Infogr.am to share them. Below the fold, I accompany the Infogr.am charts with a few observations about what they show. The Tagesspiegel reports that Hell’s Angels and militant neo-Nazis are fighting out a bloody feud in the northernmost German state of Schleswig-Holstein. It all apparently started in 2007, when a Nazi stabbed a Hell’s Angel in a fight over debts, and the Hell’s Angel barely survived. The trial about that case was supposed to take place last August, but had to be suspended when dozens of neo-Nazis and Hell’s Angels battled it out in front of the court house. During that fight, Peter Borchert stabbed a leading Hell’s Angel. Borchert is the former chair of the National Democratic Party, which received 2% of the vote in the last elections in the state. He’s already done a stint in jail for illegal arms trade. Now two unknown, masked men have shot the brother of the Nazi who started it all back in 2007 – and who was supposed to testify in the court case. He was shot on the parking place of a swimming pool. So … how wrong is it if, as a normally passionate proponent of the rule of law, you’re not all too bothered when neo-Nazis and Hells Angels start taking each other out? In other news from Germany today, a two-metre high statue of Bernd the Bread, a local children’s show character, was found back in abandoned barracks after protesting squatters kidnapped it from the town square of Erfurt two weeks ago. Reenacting their parents’ revolutions as farce? “You can only imagine the bitterness this must have left in families [with] Republican, anarchist or socialist traditions,” I wrapped up my previous post about the lost children of Franco’s Spain. This might be something to keep in mind when eyeing the still vibrant leftist countercultures in the Mediterranean. In Germany and Holland, countercultural hotbeds in the eighties, even the parties furthest to the left have long embraced classic social-democratic programmes that are more redolent of Willy Brandt than Karl Liebknecht. But in Italy, Greece, Spain and Portugal there are still significant constituencies waving the red or black flags of revolutionary communism or anarchism. Maybe stories like those of Spain’s lost children are part of the explanation: the political emotions go deeper, are rooted in more personal stories. Many [of the young people who joined the demonstrations] were joined by their parents, who experienced military dictatorship between 1967 and 1973. “I came because I felt responsible for the stalemate we left to these children to deal with [..],” said Tania Liberopoulos, a middle-aged accountant. The protests were fed by the political memory of a history of social and political struggle. Almost by instinctive conscience, many people in Greece distrust the state. The latent Greek dislike of the police, which erupted so volcanically, has its roots in the old dictatorship when the police functioned as the colonels’ enforcers against the citizens. Constant misuse of the police for anti-social purposes has led to its dehumanisation; officers are met with hate and contempt, and they hate back. I’m not sure I buy into this – or at least, I’m not sure whether it works as much of a defense.